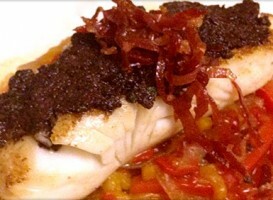 Merluza, or hake, accounts for one-third of all fish consumed in Spain, and with good reason. Hake has a mild yet meaty flavor with a beautifully buttery consistency, especially when prepared simply. The Spanish enjoy cooking fish directly on a plancha, or flat top grill. Since few of us are fortunate enough to have a plancha in our kitchens, I have replicated the technique in a cast iron pan. The fish is paired with a classic Spanish piperade, or pepper stew. Garnish with a rich olive and anchovy spread y…¡buen provecho! 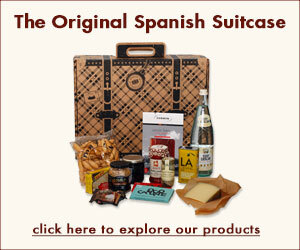 Savor authentic flavors of Spain at your very own table. Place each whole pepper over the flame on your stove top, rotating with tongs occasionally until fully charred and black on all sides. Alternately, you can place the peppers on a baking tray and place in your broiler, rotating as needed, until charred on all sides. Place the peppers in a large bowl and cover with plastic wrap to allow the skins to steam off. When the peppers are cool, remove the stems, seeds and charred skin. Julienne the roasted peppers and reserve. Meanwhile, heat olive oil in a large skillet. Add onion, garlic and salt. Cook over medium heat until onions are translucent. 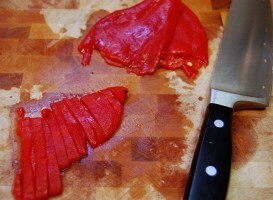 Drain, de-seed and rinse the piquillo peppers. Julienne the same as the bell peppers. Add bell and piquillo peppers, chicken stock and tomato paste to the pan. Grind some black pepper into the mixture. Cook at a simmer over medium heat until most of the moisture has cooked off, but the mixture is still wet, about 30 minutes. 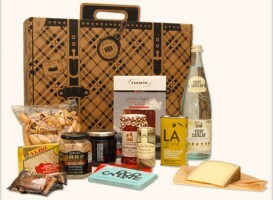 Enjoy empeltre olives, jamón ibérico, olive oil, boquerones and piquillo peppers in the Original Spanish Suitcase. Add garlic to food processor and pulse. Add the remaining ingredients and process until smooth. Heat oil in a heavy skillet, preferably cast iron. Season fish with salt and pepper. Place in hot pan, skin side down. Cook until skin starts to brown, about 2 minutes. Flip fish and cook for another 2 minutes. Flip back to the skin side down and cook until skin is fully crisp, about 2 minutes. Remove fish from pan and spread skin side with the olive paste. Place fish on a bed of piperade with a sprinkling of ham across the top. Exclusive Spanish recipe from chef Virginia Monaco featuring hake, empeltre olives, piquillo peppers, boquerones and crispy jamón ibérico. There’s a cast iron plancha for the grill, under the Steven Raichlen brand. I’m tempted, it would be a great way to sear off veggies and smaller stuff.